The tourism industry’s growth last year leapfrogged other sectors, helped in part by an increase in the number of tourists and incomes. Riding on that growth, government has announced that it is going to focus more of her energies on attracting an extra one million tourists both locally and internationally. 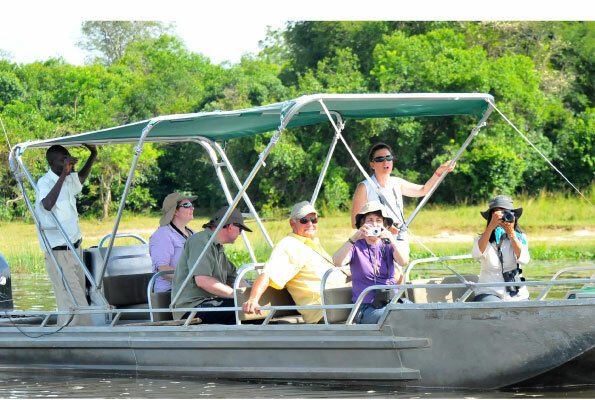 According to the Uganda Bureau of Statistics, Uganda received 1.8 million tourists in 2018, up from 1.4 million in 2017. In 2017, the 1.4 million arrivals injected about $1.4billion into the economy. This contributed to about 10 percent of the GDP. In a speech in Kampala, Godfrey Kiwanda, the state minister for Tourism, said, “We are going to increase our marketing activities by contracting three more public relations firms for Saudi Arabia, United Arab Emirates, (Qatar and Oman), Japan and China markets; the firms will be contacted at a cost of $0.5m per country,” he said. Last year, Uganda contracted three PR firms from the United Kingdom, USA and Germany at a cost of $ 0.5m each. When the new PR firms for Saudi Arabia, United Arab Emirates, (Qatar and Oman), Japan and China markets come on board, government will spend $3m on marketing Ugandan tourism. Other programmes include local and regional campaigns such as Twende Uganda, Destination Uganda and Pearl of Africa campaigns. Kiwanda said; “Last year we recruited Zarinah Hassan, commonly known as Zari Hassan, a local socialite, and Kanye West and family were here…they will be made tourism ambassadors, but this will not stop anybody willing to come on board,” he said. According to Kiwanda, in 2018 the sector did not only register strong achievements but also suffered severe tragedies and threats, which included the killing of a pride of 11 lions in Queen Elizabeth national park and the boat tragedy on Lake Victoria in November. “The strength and resilience of the sector has helped us to recover, we now have thriving lions and a growing confidence of water transport and this is evidenced by travelers who visited Kalangala islands over Christmas,” he said. On 11th September 2016, Gorilla Trackers discovered a baby Gorilla in the Bikyingi Gorilla group. The number of Gorillas in this group was previously 21 and now it appears to be 22. This baby is believed to have been born the previous day. Bikyingi gorilla group is located in Rushaga, South of Bwindi Impenetrable National Park.It has 1 silver back, 9 adult females 2 sub adults and 9 infants. It is one of the two groups that are undergoing habituation in the park. Bikyingi is also the group where the famous Gorilla Habituation Experience (GHE) is conducted at the moment. Habituation of the group started in 2013 while the GHE started in January 2015. The last birth among the gorillas in BINP was on 21/08/2016 in Bushaho- a group under habituation located in Nkuringo in the Southern sector of the park. Uganda was named the 13th Most beautiful country in the world, beating Australia,Norway,Philippines,Norway,Brazil and India…..
River is born from the “Mountains of the moon”, accurately known as Rwenzori Mountains. Lake Victoria is the biggest Fresh Water Lake in the world; its biggest part is in Uganda. Three quarters of the world’s last surviving mountain Gorillas are found in Uganda. Although it’s beaten by other countries in the size of their national parks, it has all the Animals that inhabit the tropics. When it comes to adventure, Kidepo Valley National Game Park in Karamoja stands out. Those who have visited it will agree that its extra-ordinary features shape its outstanding beauty. Many a tourist will tell you about the elephants, giraffes, buffaloes, antelopes, leopards, jackals, bush bucks, and bush pigs, among other animals in the park. But maybe there is something you have not seen. Through the streams in the Kidepo valley, dotted with palms and whistling acacia thorns, stands Kanangorok hot springs, a place where mother nature waved her magical wand and created one of the most natural of all wonders, natural hot mineral water. This remains a myth to those who have not visited it and a secret to those who have been there. Kidepo is not short of mysticism, and Kanangorok hot springs forms part of this. According to the conservation area manager, Johnson Masereka, the water is heated deep within the earth and come out as crystal clear carbonated water that is famous for their mineral content and legendary healing powers. 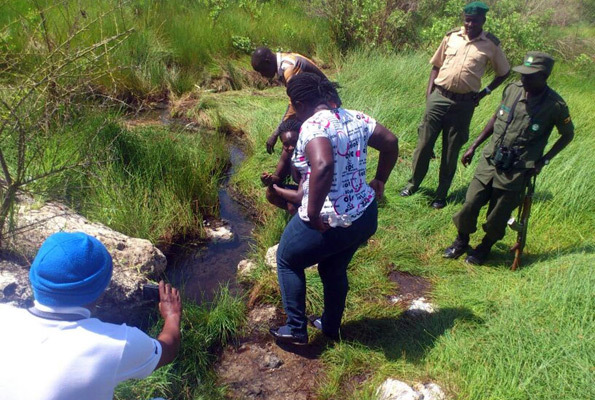 Masereka says the Kanangorok hot springs, that flow between rocks, over-look expansive grassy plains dotted with big rocky outcrops and flanked by steep-jagged mountains with the summit ridges of Napore range, Taan and Natera hills, part of Nyangea, Morongole and Zuulia forest reserves. Phillip Akorony, a guide at the hot springs, says Kanangorok is one of unique gifts of nature that makes Kidepo Valley National Park a must-visit destination for tourists. He reveals that owing to the belief in their healing powers, the hot springs are an attraction to tourists and natives who bathe in the warm water believed to cure some skin diseases. However, despite hosting this treasure, there is no road or clear path leading to the hot springs. One has to manoeuvre through scattered thorny trees along narrow footpaths subdued by overgrown grass and shrubs that scratch and pierce one’s body as they advance. A hundred metres away from the hot springs lie two rocks that look like rivals meeting for a confrontation. At this point, the hot springs are visible. Being shallow, one gets a magnificent view of the clean rocks. Right in the middle of the water lies the spot hot enough to boil food. The hottest spot is about three metres in length but it is not clearly visible as it has been covered by rocks and vegetation due to years of neglect. On arrival to the site, one will notice dead cockroaches and other insects floating on the hot waters. This is the point believed to possess healing powers. But there is a lot of smell of Sulphur all over and when one bends to touch the waters, the smell of Sulphur remains in their hands.Many people allegedly bathe in the waters at this point. Kanangorok hot springs has a temperature of about 60°C and a flow rate of 1 l/s. It is rocky all around and the surface geology indicates that the springs issue from alluvial and pediment gravel material at the base of Mt Murungole and is crossed by rivers Kidepo and Narus. Geologists believe there could be travertine deposits, and sulphurous algae and hydrogen sulphide. “We intended to open up this place and build around it but the Ministry of Energy and Mineral Development said it would develop this place to get economic value from this treasure,” says Masereka. For most of the year, a lack of surface water means that little wildlife is found in Kidepo valley, though it is still worth the drive to visit the dry Kidepo River to stroll along its 50m wide bed of white sand between banks covered with borassus palms. According to Akorony, Kidepo comes from a Karimojong word “Kidep”, which means “to pick from below”. It was named by people coming to gather fallen borassus fruit below the valley for fermenting to make palm beer. The Kanangorok hot springs lie 11km beyond the Kidepo River on the Sudan border and this is a glorious place to sit and view the mountains beyond the frontier. Local legend has it that it was named after Longorok, a young man assigned by a Sudanese traditional king to carry water in a gourd from Kochetut to Lotukei village in Southern Sudan. This was meant to appease the gods to let the rains pour in Sudan after a long period of drought . “But on reaching this spot, clouds gathered and it rained heavily. Lightning struck, blinding Longorok, who later died. It is believed his blood and water mixed and then begun boiling and coming out of the rock that was later named Kanangorok,” narrates Phillip Akorony, a guide at the hot springs. The Uganda Wildlife Authority has just released some fantastic news for gorilla tracking in Uganda. They have announced a low season promotion to enable visitors to enjoy their gorilla tracking experience at a discounted price. The promotional prices will apply for visitors wishing to track the gorillas in Uganda during November, April and May 2014. Poachers and dealers in illegal animal trophies now face life imprisonment and a fine of more than KSh20 million (about Shs580 million) under a new law meant to protect endangered wildlife like elephants and rhinos. The new law has also increased compensation for deaths and injuries caused by wildlife to about Shs145m and Shs58m respectively. Kenyan President Uhuru Kenyatta signed the Wildlife Conservation and Management Act into law on Christmas eve. The stiff punishments are meant to tackle the rising cases of poachers killing wildlife for tusks, horns and skins for sale in the thriving South Asia market. Weak laws have seen Kenya become a conduit for smuggling illegal animal trophies. “We are happy with the deterrent passed. With proper co-ordination with other government arms like Interpol and customs, we’ll curb the current situation. However, even with the laws, we still need Kenyans to work with us to save our animals,” said Kenya Wildlife Service (KWS) communications manager Paul Udoto. Conservationists have previously called for stiffer penalties to tackle poaching, which has hurt the tourism industry, a top foreign exchange earner in Kenya. The country has around 40,000 elephants and 1,025 rhinos. Sport hunting, now classified as category B, will attract a five-year jail term, Sh5 million fine or both while category C animal hunters will pay about Shs29 million, a two-year jail term or both. Those found hunting or trading in bush-meat face a one-year jail term, a KSh200,000 fine or both if convicted. Compensation for life lost to a wild animal has been increased to Sh5 million. Those who are maimed will receive Sh3 million while those injured will receive a maximum of Shs58 million, depending on the injury. Last year, three East African countries of Kenya, Uganda and Tanzania were among eight countries that faced economic sanctions over their failure to prevent widespread elephant poaching. A report by Convention on International Trade in Endangered Species (Cides) increasing poaching levels, as well as loss of habitat are threatening the survival of the elephant population in Central Africa as well as previously secure populations in West, Southern and Eastern Africa. Thailand, China and Malaysia were also considered for sanctions because of claims that widespread corruption the report said was frustrating anti-poaching efforts. The report cited elephant population across Africa to be “under severe threat” as the illegal trade in ivory has grown over the past decade. Kenya, Tanzania and Uganda are source countries while Malaysia, Vietnam and the Philippines are countries through which ivory is smuggled, while Thailand and China are destination countries.